Posted Tuesday, February 4th, 2014 by Robyn Warner. The 2014 Winter Olympics in Sochi begin this week, and at $50 billion and counting, these Games have already ranked as the most expensive in history. While there is always much to look forward to with any Olympics, years of work have gone on behind the scenes to prepare for the 17-day event, including new technological advancements that will make this Olympics unlike any before. Since Sochi technically falls within a sub-tropical climate zone along the shores of the Black Sea, there are concerns over the venue’s ability to provide enough good quality snow. Organizers of the Vancouver Olympics four years ago were criticized for their lack of snow, and last year’s cancellation of the slopestyle skiing and snowboarding World Cups in Sochi due to insufficient snow prompted current Olympic organizers to execute various precautions (or snow-cautions, if you will). 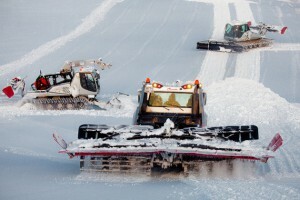 Mikko Martikainen, whose Finnish company Snow Secure drafted the master plan for snow production at the Games, has ensured there are snow machines – snow cannons and snow guns – on hand at all of the slopes. Because of the way it’s made, artificial snow is often thought to trump Mother Nature’s quality. The air turbulence generated by snow machines yields small spheres rather than traditional six-sided flakes, and the smaller surface area of the spherical shape allows for increased melting resistance. 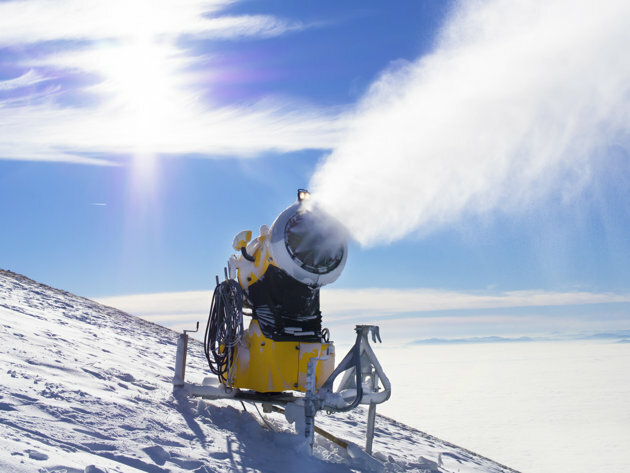 Snow cannons work by introducing the perfect amount of water vapor into a cool atmosphere under pressurized conditions to form flakes smoother than real snow. According to Martikainen, the artificial snow guns will also guarantee mountains of white regardless of the weather. Beyond cannons and guns, Sochi organizers have also been keeping 16 million cubic feet of last year’s snow cold using highly-insulated isothermal blankets and digging channels from the highest peaks down to the ski slopes to encourage snow accumulation in the competition areas. 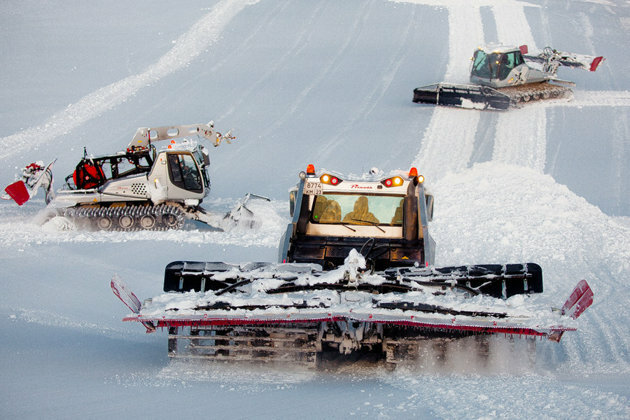 Snow-grooming machines will additionally be on hand to maintain top condition in all the outdoor courses – much like the machines which resurface ice rinks. When it comes to advanced technology in action at the Winter Olympics, it won’t be all about the snow. The U.S. speedskating team will soon be sporting new duds as the result of collaboration between Lockheed Martin, the world’s largest defense contractor, and performance clothing specialist Under Armour. The two companies have engineered the “Mach 39,” a super-aerodynamic, top-secret suit more than two years in the making that boasts minimal drag and supreme air-cutting abilities. While it may look like your everyday skin-tight skating suit, the Mach 39 now features key enhancements, including an open, heat-reducing mesh panel on the back; anti-friction fabric on the thighs, and improved placement of the zipper diagonally across the chest. Most importantly, however, Lockheed and Under Armour have covered the futuristic suit with little bumps or dimples designed to disrupt the air in the same way a golf ball does – an insight they gleaned from using wind tunnel tests to evaluate the aerodynamics of their prototypes. The Mach 39 will likely draw comparisons to Speedo’s infamous full-body LZR swimsuit, which was introduced in 2008 and subsequently banned after competitors wearing it smashed world records. Therefore, the team that designed the speedskating suit pored over the rules to avoid similar controversy. Another technological boost to Team USA’s potential medal count in Sochi comes in the form of a newly designed two-man bobsled by German automaker BMW, who joined the U.S. Bobsled and Skeleton Federation in 2012. Although BMW knew little about bobsledding initially, it had plenty of expertise in motor racing, aerodynamics, and advanced materials to recommend a partnership. How Long Will You Have Your Smartphone? Robyn Warner has been writing since she learned how to hold a pen. She wrote her first book of poems before the age of 10 and is currently enrolled in college to learn how to properly structure her natural ability. Though creative writing is her preference, she is enjoying life in the technical blog world. Robyn’s goal entering her 30’s is to use her writing to inspire fellow cancer survivors and have a job that gives her the flexibility to live anywhere and never wear shoes. You can find her on Google+.